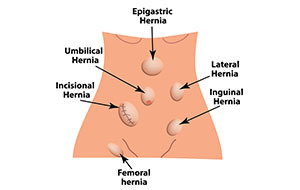 An incisional hernia is a defect in the abdominal muscle beneath a previous surgical incision or penetrating wound. 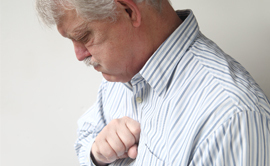 The defect results in a swelling beneath the skin and is often painful or sensitive. Once discovered, it is important to repair an incisional hernia as they tend to enlarge, become more symptomatic, and serious complications such as gangrene of the intestine may develop if the bowel gets stuck in the defect. Incisional hernias can often be repaired laparoscopically via three or four small incisions in the abdomen, but may require a larger incision (open surgery) depending on their size and location. The aim is to close the defect with the help of a soft polypropylene mesh, which is usually placed on the inside of the muscle, and acts like a patch. 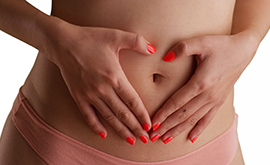 Between 45 minutes and two hours, depending on the size of the hernia and how much scar tissue is found inside the abdomen. Between two and seven days, depending on the size of the hernia and the difficulty of the operation. You will need to be off work for ten days. Dr. Marr advises no driving or physical activity for ten days. Usually you can resume light repetitive sport after a month, but this can be sooner for smaller hernias. How long will I have pain? Pain varies, but you will usually require painkillers for between five and ten days after surgery. There are dissolving sutures under the skin which you won't see. Leave the dressings on for two weeks. They are waterproof, so bathing or showering is okay. You will need to come back for a short follow-up visit two weeks after surgery. Dr. Marr has a specialist surgical practice with a focus on laparoscopic, bariatric, hernia and thyroid surgery. He is also able to perform certain out-patient procedures at his practice. Laparascopic and General Surgeon based in Cape Town. © Copyright . Dr Ian Marr. All rights reserved.